During the new year, I must admit that I’m one of those who promised to lose weight during the season of new year’s resolutions. During that time, I noticed, I’ve been promising that to myself over and over each year but fail to commit after a few months because I tend to lose track of my health goals. And so in order to keep track of my health and weight-loss progress, I got myself a set of these digital health monitors from iHealth! Instead of buying the usual weighing scales, activity monitor and blood pressure monitors separately, I thought it would be better to purchase gadgets that I can all conveniently sync into my smartphone so I can check, save and monitor my progress anytime anywhere. First, I only wanted to get myself an ordinary scale but I realized getting a Body Analysis Scale was better, so I could learn more about my body’s state of health. With the iHealth Wireless Body Analysis Scale, not only will you know and track you weight, but also your BMI, Body Fat, Lean Mass, Muscle Mass, Bone Mass, Body Water, Viceral Fat Rating as well as your Daily Calorie Intake (DCI). Once you connect the scale to your home WiFi network, it will communicate all your data to the iHealth MyVitals app. Create a personal weight goal with timeline and the app will help you keep track of your progress. The scale that has both looks and the intelligence to give you the best insights to your body composition. Set up is so easy! You only need to download the app on your iOS device, connect on your wifi, turn on Bluetooth and it will automatically sync. Having a digital blood pressure monitor at home is ideal especially if you have relatives that need to be monitored regularly. The cool thing of having an iHealth Wireless Blood Pressure Monitor instead of the regular ones of course, is that you can sync the results right on your app to keep track more efficiently. The iHealth Wireless Blood Pressure Monitor is a fully automatic arm cuff blood pressure monitor that uses oscillometric principle to measure your blood pressure and pulse rate. Just sit back and relax in the comfort of your home, slip on the monitor and with the push of a button the iHealth MyVitals app starts and records the measurement. It works well with your mobile device to test, track and share vital blood pressure data! It’s also very handy and comes with a slim pouch for easy handling. Just connect it to a USB port to charge before using of course. Forget the wires and tubes. This no hassle monitor makes it easy and convenient to check your own blood pressure, anytime and anywhere! To further help me monitor my progress, I also started using the iHealth Wireless Activity and Sleep Monitor. I must admit that I had a bit of difficulty in syncing it to my device at first , but after a couple of tries, it was finally able to function! Aside from eating healthy, one of my major goals this years is to be more active instead of just lounging around after food trips. I actually started exercising late last year when I enrolled at Fitness First. Running really improved my state of health especially with my endurance. The free iHealth MyVitals app automatically keeps a history of your data and gives you the option to share your information with your doctor or caregiver. This device will definitely challenge you to get moving! Whether you’re a marathon runner or a power-walking machine, the iHealth Wireless Activity and Sleep Monitor will keep up with you and give you the best insights to your steps, distance and calories. It works 24 hours a day and automatically switches modes when it detects you have gone to sleep or taken a quick nap. Sync with the app and observe your sleep efficiency score, hours slept and how many times you’ve woken. 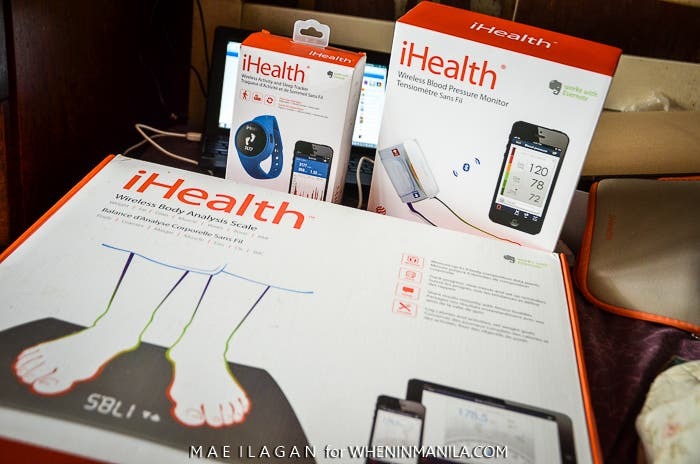 So when in Manila and looking for easy-to-use products to help you keep track of your goals and stay healthy, check out these cool high tech digital monitors from iHealth Labs! Click HERE to order via Visiontec Marketing Inc.